Did you know some of the best apps for the iPad are already on your device? Apple includes a number of apps with the iPad including a music player, a calendar, maps, reminders, etc. So before you hit the app store in search of the perfect app, you will want to familiarize yourself with what apps come with the iPad. We'll start with an app that is not even on the Home Screen. Siri is the voice-recognition assistant on the iPad, and unfortunately when you consider how much Siri can boost productivity, it is often overlooked by new users. You can activate Siri by holding down the the Home Button for a few seconds and interact with her through normal language. For example, "What is the weather like outside?" will get you the forecast and "Launch Calendar" will open the Calendar app. These apps are loaded onto the iPad's Home Screen. Remember, the Home Screen can have multiple pages, so to see all of these apps you may need to swipe to page two. You can do this by placing your finger on the right side of the screen and moving it to the left side of the screen without lifting it. Because you probably won't use all of these apps, you may want to delete those you will never use or simply move them to a folder. FaceTime. FaceTime is the video conferencing software that links the iPhone, iPad, and iPod Touch. First introduced on the iPhone, it is actually rather easy to use FaceTime on the iPad. You can make FaceTime calls on 4G or Wi-Fi, and if you don't like the idea of video conferencing, you can also make audio calls through FaceTime. Calendar. The calendar app will allow you to set up events and share them through iCloud with any other compatible devices such as your iPhone. The iPad can also pull in events that are sent to you in Mail or through iMessage. You can also add to the Calendar by telling Siri to "Schedule a meeting with Michael for tomorrow at 9 AM." Photos. Where do all those photos that you take with the Camera and Photo Booth go? They go to an internal folder that can be accessed with the Photos app. You can also set this app up to do a slideshow. If you aren't going to be using your iPad to take many photos, this app makes a great candidate for moving to the home screen. Camera. The iPad 2 added both a front-facing and a back-facing camera, and both can be accessed through the Camera app. Simply tap the button in the upper-right corner to switch between cameras. You can also go from picture mode to video mode with the switch at the bottom right. Contacts. The iPad supports both instant messaging through the Messages app and video conferencing through the FaceTime app, so having your contacts on the iPad can be very handy. Best of all, these contacts can be synced with your iPhone via iCloud, so you never have to worry about manually typing in the contacts from your phone. Clock. The Clock app contains an alarm clock, a stopwatch and a timer. It also has the Bedtime feature, which recommends sleep time based on your sleep patterns. And, of course, it will give you both the current time and the current time in different places in the world. You can even add a specific location to the world clock view, and if you don't want to hunt for the app, you can set a timer by telling Siri to "set timer for 10 minutes". Maps. Don't dismiss the Maps app just because you may have GPS installed in your car. Maps has become a great alternative to Google search with the ability to locate restaurants and businesses in a specific area. This makes it a great way to find the closest movie theater, fun attractions or a great place to shop for clothes. It is also tied into Yelp, so you can get instant reviews of your search results. Home. If you are interested in "smart" technology, you will want to become familiar with the HomeKit on your iPad. This is the app that will keep track of all the various smart devices in your home such as a smart thermostat, front door lock or garage door. Videos. The videos application is where you play the movies and TV shows you buy on iTunes or transferred to the iPad from your personal library. The videos app can also play movies from the cloud, so if you bought a movie from iTunes on your PC, you can play it on your iPad without transferring it. Notes. The equivalent of Notepad on Windows, the Notes app does exactly as you would expect: allows you to type in a quick note. But don't dismiss it. Because you can store notes in iCloud, it makes a great way to create a grocery list that you can type on your Mac or iPad and then view on your iPhone at the store. It also supports drawing, images and basic formatting like bold, italics, etc. Oh, since notes can be shared with (and edited by) other people, it's a good alternative for small collaborations, too. Reminders. The Reminders app can serve two purposes. First, it is great for setting up a reminder. You can choose a day and time for the reminder and even have it repeat on a regular basis. Second, it can be a great task list. And last, it is easy to tell Siri to "remind me to take out the trash tomorrow morning." News. The News app is a great way to start the morning. When you first launch News, you will be asked to pick out some of your favorite topics. After you set it up, News will give you a curated look at the news with an emphasis on those topics. The News app takes content from around the web, so you'll read articles from the New York Times, Wall Street Journal, etc. iTunes Store. The iPad version of the store has most of the same features as the PC version. You can buy movies to play with the Videos app and music to play using the Music app. You can also download any music you bought using iTunes on your PC without actually hooking up your iPad to your PC. App Store. The App Store is where all the fun begins. This application is used to buy games and apps for your iPad. And don't worry, even if you don't want to spend money on an app, there are plenty of great free apps available for the iPad. iBooks. The iPad makes a great eReader and supports various third-party readers like Amazon's Kindle, but iBooks may be the very best reader for the iPad. It has those extra touches that Apple is known for and includes a healthy store with almost any book you can imagine. Settings. All of the settings for both the iPad and various apps are includes in the Settings app. You can limit notifications, turn off Wi-Fi, add parental restrictions and configure your email accounts from within the Settings app. Tips. If you are just getting started with the iPad, you may want to give Tips a look. This app is exactly what you would think: a collection of tips and tricks for getting more out of your iPad experience. Podcasts. The Internet has changed the world in many ways, including the ability for anyone to host their own talk radio show. 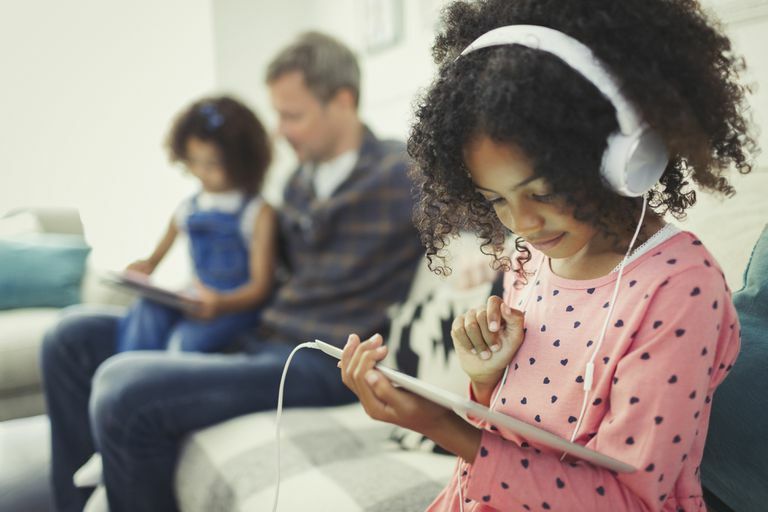 Podcasts can range from the educational to the entertaining and almost everything in between. Like the iBooks, Videos and Music apps, the Podcasts app allows you to add and organize your podcasts. Photo Booth. This neat application will let you take fun photos, including one with a twirl effect that will make the image look like it was taken through a circus mirror and stretch effect that can create the longest chin in the world. Find iPhone. After all this time, the Find My iPad app is still called Find iPhone. But it acts the same regardless of if you launch it on the iPhone, iPad or on your PC through icloud.com. So long as you have Find My iPad turned on, the "Find iPhone" app will show you where your iOS devices (iPad, iPhone, iPod Touch, etc.) are located. Find Friends. This app is basically the Find iPhone app for your friends. You can elect to share your location so your friends know where you are, and if they share with you, Find Friends will show you what your friends are up to at any given moment. Files. One of the best recent additions to the iPad is the Files app, which allows you to access your local documents and files on cloud services like iCloud Drive and Dropbox all in one location. Combined with the drag-and-drop feature, this makes a powerful one-two punch for managing files. iCloud Drive. This app doesn't automatically install, but you may be asked to install it if you use iCloud services. It is basically a file manager for apps that use iCloud Drive such as Pages or Numbers. The dock is the bar across the bottom of the iPad's display. The iPad comes with four apps on the dock, but it can actually hold up to six. Moving an app to the dock allows you to have quick access to it even when you are scrolling through pages of apps. Messages. The Messages app will allow you to send an instant message to anyone with an iPad, iPhone or iPod Touch for free. Messages is a great way to cut down on your text messages bill if you aren't on a monthly plan. Safari. This is the default web browser for the iPad. As such, it makes a great candidate for remaining on the dock. You'll find that the iPad makes a great way to browse the web. Mail. The mail application can be set up through settings. It supports Gmail, Yahoo mail, Hotmail, AOL mail and most other forms of email. The Mail app has a universal view that shows all of your incoming email, as well as the inboxes, broken out by the specific client. It is also a great candidate for remaining on the dock. Music. The music app will let you play music downloaded from the iTunes store or synced from your computer. You can also play music on your PC without syncing to iTunes by using Home Sharing. Not all iPads are created equal. Apple began giving away its iWork and iLife suite of apps to new iPad owners several years ago, but instead of using up precious storage space with these apps, Apple only preloads them onto devices with higher storage capacity. But if you have bought a new iPad within the last few years, you can still download these apps for free from the App Store. Pages. The Pages app is a word processor similar to Microsoft Word. It is quite capable of most personal and light business uses. Numbers. This is Apple's Excel equivalent, but don't dismiss it out of hand. It has many of the same features as Excel. Keynote. The last app in the iWork suite is the presentation software package called Keynote. Like Pages and Numbers, Keynote is tied into iCloud Drive, so you can create a spreadsheet on your Mac, edit it on your iPhone and show it on your iPad. Garage Band. Apple's music studio is fun enough to let you play virtual instruments and powerful enough that a band can record a song with multiple tracks into it. iMovie. Perhaps the best app for personal use, iMove lets you edit and splice together your home videos or create a fun movie trailer out of the video taken on your iPad.